The best fun outdoor games for kids are firstly fun activities for kids, While also at the same time giving them exercise and keep them healthy. kids summer outdoor games like this should be the top of your list of "fun activities for toddlers". There are plenty of FREE toddler games for you and your kids to get involved with. Most of these toddler games are easy to organize and you don't need to spend much money, or any money in most cases. When it comes to games for pre schoolers it is best to have toddler games that don't always have to have a winner and losers. All toddlers want is to have some fun and play games. So lots of silly games that will have them laughing out loud are the order of the day. 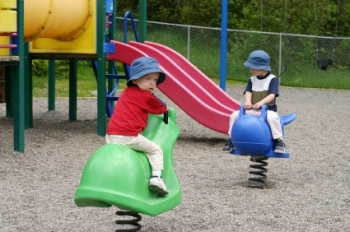 So have a look below at these toddler outdoor play ideas and games. Kids just love messing around with water, so organize a few games for them on a hot sunny day. You will need some or all of this stuff depending on the toddler game you are playing. any of these are fun outdoor games for kids. Kids paddling pool, buckets and bowls, squeezy bottles, sponges and brushes and any other bath toys you can find. Take a look at all the water games for kids ideas here. You don't have to be in the big outdoors to play these games. You can put up a tent in the back yard for your little ones so they can play at camping. You can have a pretend campfire and play circle games around it. You can also organize some really exciting hunting games for kids that have them looking for stuff all over the back yard. Take a look at all the kids outdoor camping games ideas here. If your having a toddler party and the weathers fine. Then what better way than to have it outdoors and the kids outdoor games as well. Circle games are a real winner at toddler parties, especially games like "pass the parcel". Kids also love silly games that don't really have a winner such as "follow my leader", "musical pillows" and "balloon popping". Take a look at all these outdoor games for kids ideas here. These hide and seek preschool kids games are not about the kids hiding away. They are more about looking for stuff that's hiding like where are the "teddy bears" hiding. Also hiding games for toddlers that get them thinking with some simple clues. They have to follow the simple clues to decide which box the daddy bear is now hiding in. Then which box the mummy bear is hiding in then finally which box is baby bear hiding in. They play this fun outdoor games for kids as a group not against each other and you also hide some small bags of candy with each teddy bear for the kids to find. Take a look at all these hide and seek games ideas here.